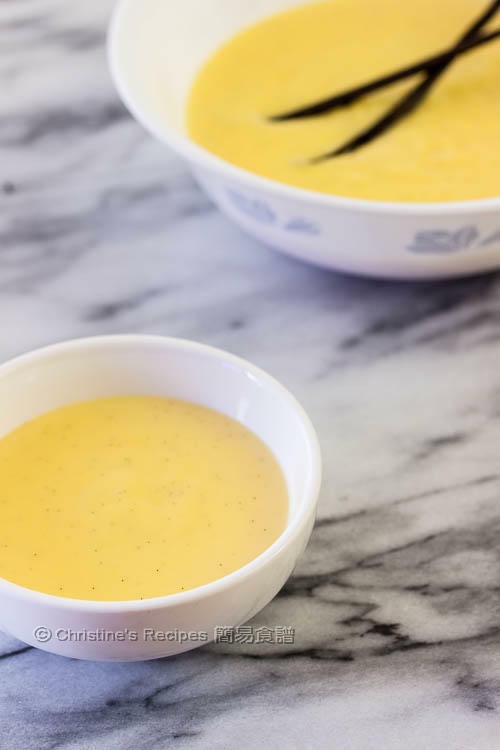 This vanilla custard is so tasty, smooth and easy to make, very versatile for perfectly going with any desserts. 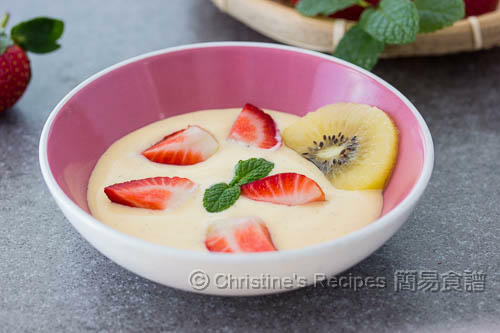 When the weather gets cold, I like to serve warm custard with some of my favourite fruits or chocolate pudding. It gives me a warm feeling. But if you like it cold, the taste is equally good. What most pleases me is that custard has a magic turning my family to like eating more fruits. I followed this recipe step by step without any failure at the first time. I like to serve it with seasonal fruits with pastry. 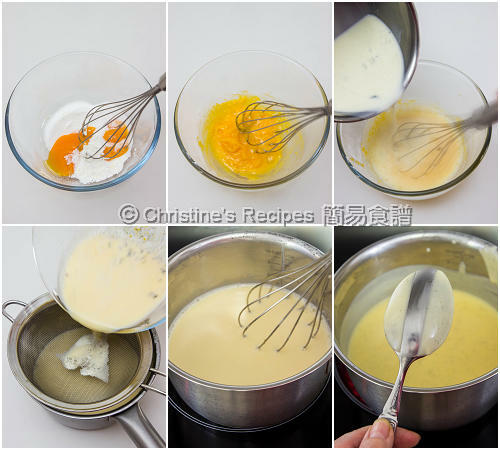 In a small saucepan, combine milk and thickened cream. 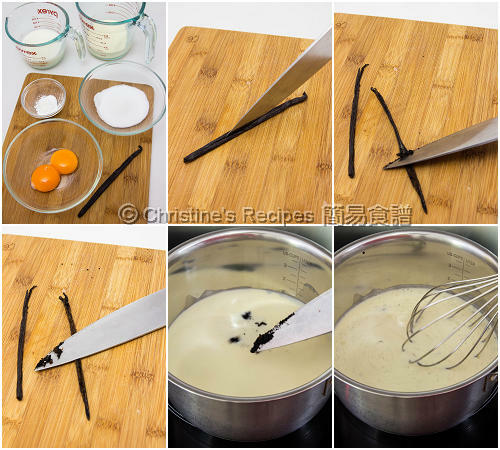 Use a sharp knife to slice vanilla pod in half lengthways and scrape out the seeds. Add seeds into the milk mixture. Cook over medium heat and stir constantly for about 5 minutes, until hot. But don’t allow to boil. Remove from the heat. In a large mixing bowl, combine the egg yolks, sugar and cornflour well. Strain hot milk mixture over egg yolk mixture, stirring continuously. Drain through a fine sieve into the saucepan. Cook over medium-low heat, stirring constantly, for about 15 to 20 minutes, until custard thickens and coats the back of a spoon. Don’t boil it anyway. Let it cool down. Serve with strawberries or any favourite fruits. Very delicious. Vanilla pod is available at supermarkets or bakery shops. Or you might replace it with ½ teaspoon of vanilla extract. 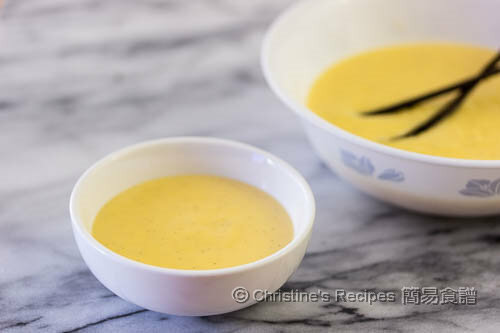 Don’t allow the custard to boil as it might curdle as a result the texture won’t be smooth. The leftover egg whites can be used for making coconut macaroons, or steamed ginger milk custard. Vanilla custard is one of my favourites. It is delicious warm or cold!